Dr. Aaron Carrel received his medical degree from the University of Buffalo School of Medicine and completed residency training in pediatrics and fellowship training in pediatric endocrinology at the University of Wisconsin Children’s Hospital. He is board-certified in pediatrics and pediatric endocrinology, with special interests in childhood growth and weight disturbances, and Prader-Willi syndrome. 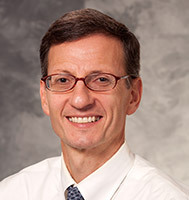 Dr. Carrel is also medical director of the UW Health Pediatric Fitness Clinic in Madison, Wisconsin.